I haven't been in a while, but Buffalo Wild Wings is kind of incredible. It offers 14 distinct sauces for its wings. You can get something called "Asian Zing" dumped all over your chicken bits and simultaneously watch 43 billboard-sized televisions. Colton & Farb Gallery offers a similar yet more art-based experience. The chicken bits are a mix of oversaturated art like Robert Indiana and Yoko Ono topped off with the "Zing" of Jay Rusovich. Also, Colton & Farb offers a great selection of hors d'œuvres at their openings. Once special to Buffalo, where they are (according to Wikipedia) referred to as simply "wings," Buffalo wings are so popular in America that you'd swear the factory farms were churning out Frankenchickens with eight wings to keep up with our red-mouthed demand for more. Likewise, people can't get enough Robert Indiana. He did that giant love statue thing that one time, and people asked him to do it over and over and over and over again, so they could all be reminded of love. And Yoko Ono broke the Beatles up, which was really great. Both of these artists have accomplished careers that merit a ton of respect, and I cannot deny the influence of the work. However, we need more venues for this kind of artist in Houston like we need an eight-winged-beast chicken. There is so much great art in the city that deserves focus and attention, and yet there are so many galleries like Colton & Farb that fill our consciousness and e-mail inboxes with "really important" art shows. That Colton & Farb continue their circus of art for folks who buy blue chip artists like Exxon stock or, at very best, people who like big naked asses, saddens me. Instead of using their huge piles of Scrooge McDuck-sized money to develop the great talent of this city and invest in curators and art people that actually know what they're doing (of whom there are quite a few), they run a party space that has great food. And Buffalo Wild Wings is a party space with great food. I love it. You can see plenty of large asses there, and the 43 billboard-sized televisions? Where else are you going to find peace? Positive Perceptions & IKONIC run through November 5 at Colton & Farb Gallery, 2445 North Boulevard. 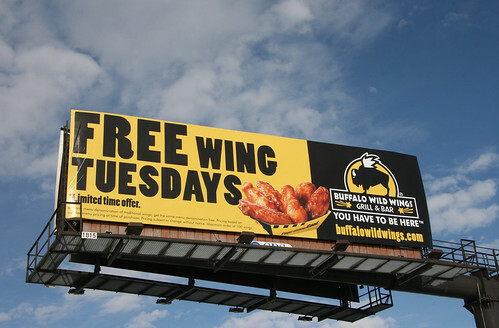 And you can find a map of all the Houston-area Buffalo Wild Wings locations here.